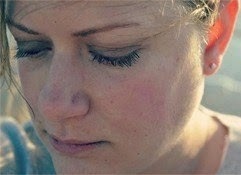 Getting in touch with my wild side | Life. Realized. Perhaps I'm a little behind trend, but my love this Thursday is animal head-themed decor. Particular those belonging to the phylum Cervidae. That includes deer, moose and caribou. I learned that term last semester in Vertebrate Zoology...and I think I found my one and only opportunity to use that rather random bit of knowledge. Even here it was a stretch, so I am going to move on. I am not a hunter, nor would I want a real head mounted on my wall. My house doesn't have even the slightest rustic feel. I don't eat wild game or beef, and occasionally I have a "I can't eat meat anymore!" moment. My husband grew up on a cattle ranch in rural Montana. His friends and family hunt for food (and some for sport). I certainly respect the lifestyle...it's just not me. Despite all the reasons not to like it, I am really attracted to this funky trend of mounting resin or ceramic heads. I can't explain it. Perhaps it is the art deco feel that makes it seem less, well, like mounting an animal head. I am really liking moose heads in particular. I found a resin one on Amazon for a reasonable price, and intend to spray paint it white and mount it inside an ornate frame (my vision is similar to #1, below). I think I even managed to get Husband on board. I figure it will either turn out amazing and we will love it, or it will be a total DIY disaster. Either way, my head is in the game. See what I did there? 1. I love this take on the trend. I just wish I could find a head that cool at a local store. 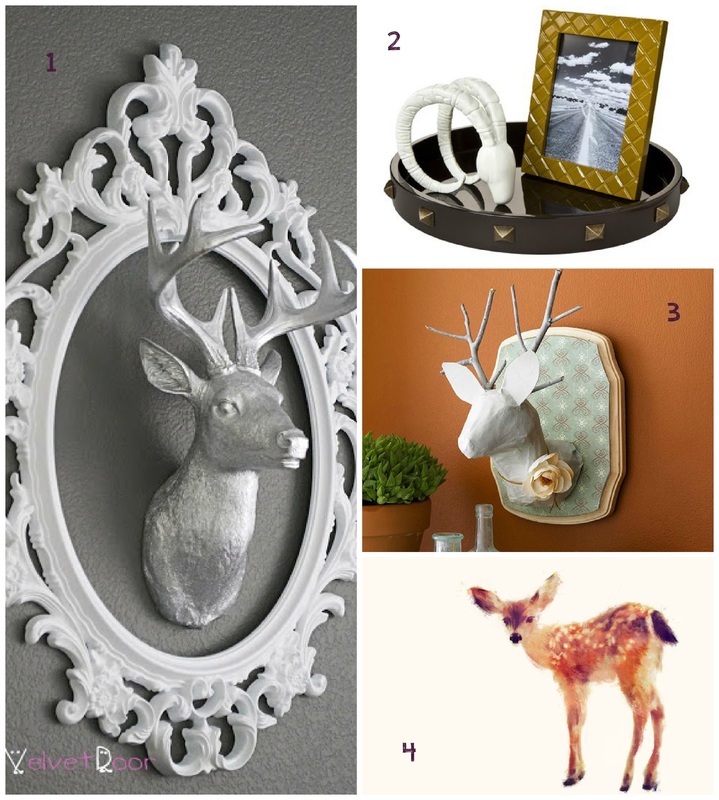 [Silver deer head tutorial by The Velvet Door] 2. I looked at these little abstract horns a zillion times over the holidays but never pulled the trigger. I finally decided they must be mine, and gone. Now I can't find them anywhere. Bummer. [Aries horns by Nate Berkus for Target] 3. How cool is this paper mache head with tree branch horns?! Perfection. You can find the complete tutorial courtesy of Better Homes and Gardens. You will probably see my take on this in the months to come. 4. I ordered this adorable fawn print from my new favorite art website, Society 6. I can't wait for it to show up in my mailbox. 5. Another Society 6 find. If the head thing doesn't pan out, I can always frame this moose head print. The colors are just lovely. 6. 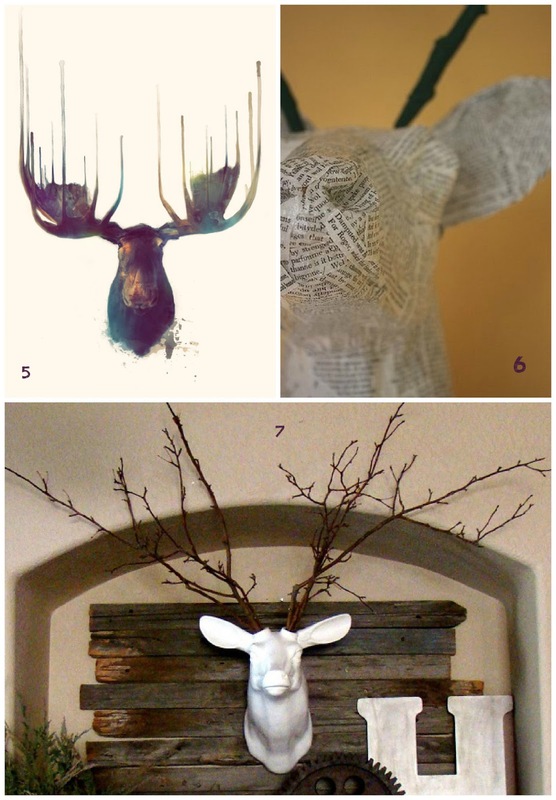 I love this DIY newsprint wrapped deer head. It would look so cool in an office or library (because I have a library in my dream house). 7. This may be my all time favorite animal head project. I am totally digging Kim's Rustic Industrial Mantle. There were easily 20 versions of this project I could have posted. It was so hard narrowing it down. Just type "deer head" into Pinterest and you'll see what I mean. Patterns and textures on a million different mediums...people are amazing. I found a resin moose head. I found the frame. I found the perfect tutorial. Now I need to get on it. I think No. 3 is my favorite ... so pretty! I think you can't go wrong, and you will absolutely love it! Good luck. I vote number three, too. I vote 1!!!! I love the frame around it! I LOVE #1 and #7. Never thought to decorate like this but I like it! My husband would NEVER go for it...he is from Harlem! My husband was resistant at first...but he had to admit some of the projects were really cool. :) I never thought I'd like this trend, either, but I am really attracted to it! Ooh #5 is very cool! I remember looking at a bunch of antlers while antique shopping in the summer..for some reason they were all creepy and weird looking. But I love the look...especially at Christmas, with gold spray paint!